Club Penguin Cheats by Mimo777 Club Penguin Cheats by Mimo777: 2011 Club Penguin Puffle Party! Woot! The Club Penguin Puffle Party is here! 1. Go to Town or the Plaza or the Puffle Show. 2. Click on the box of hats. 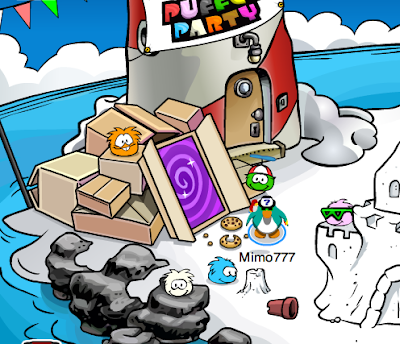 There is even a Box Portal at the Beach so it will be easier to get the the Box Dimension and watch those Orange Puffles eat cookies! Yum! Saweet! Lots o' fun at the Party, huh? Let me know what your favorite part is! OMG. This looks so cool! Thanks mimo for everything! i think its the best party EVER!! i was wondering if the red puffle might be there! Mimo! i got banned for 72 hours! i was in the underground pool, and i looked at my hand items, there was a fiesta hat in it. i clicked it, and it said i was banned for hacking. Im sad! I just got membership! I have a cheat for the puffle party. 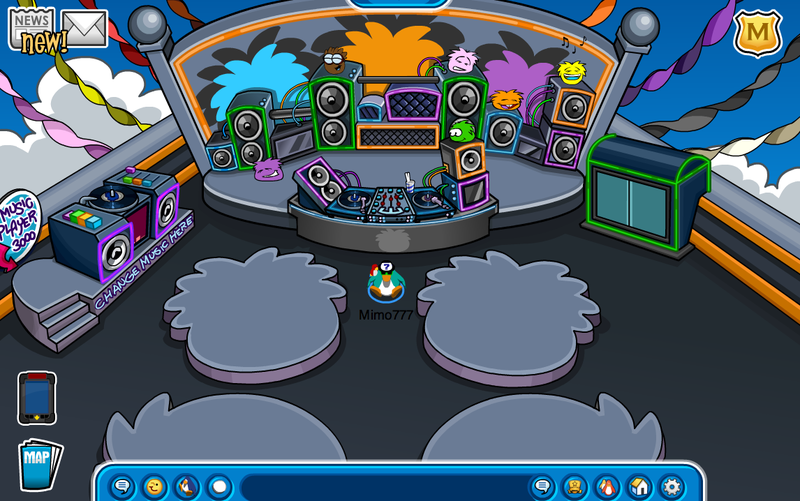 If you go to the Night Club it has a puffle themed music but if you go down the ladder in the speaker to the boiler room it still plays the original faint Night Club music. Weird?! I can not tell you why it isn't letting you but I can take a guess at it. Sometimes Club Penguin has gliches and you can't wear some things. (Trust me I got an iteam for free and sometimes you just have to log out and log back in. Other times it takes a few days) If you can't wear it here soon then I would contact Club Penguin. Hope that helped. It is! Go to the cove and they have an entire party of red puffles. I just don't know why there was no box! Oh I am so sorry Jaden58213! Just to ask why was there a hat in your hand iteams? Lol. I would just keep contacting Club Penguin and soon enough (hopefully before the 72 hours) you will have your penguin back. I'm sorry! And that would be so cool if we could do that. Great idea.vHopefully you cacn find something amazingly awesome to do. Oh i see thats so cool when you walk your puffle the ballons change to that color Nice! I dont like it, I LOVE IT!!!! Mimo, when a room is full cp took away the x button on the map. So now you can't keep trying to get in. Thats not good. hi mimo. the puffle party is awesome!!!!!!! Weeeeell.... I didn't really LOVE this year's party, though.... I mean, it's cool and everything, but they should've had some kind of cool activity. This same thing just happened to me. I contacted Cp and let them know. That hate was in my hand iteams so there is something wrong.I know your pain. Hang in there. I think I figured out why. Both Jaden58213 and I got banned because that little hat was in our hand iteams, and when we clicked on it, it said something and we got banned for 72 hours. There is something wrong with that so keep an eye out and don't wear the hat until the problem is fixed. Whoa! That is an awesome discovery! Thanks for letting us know! My favorite is the white puffle room, too. Don't feel left out, I wear black all the time! You noticed that? Wow! I just thought it was because all the ballons were white! Thanks! I didn't know that. Whenever it said a room was full to me, the 'X' button was always there. If this happens again I would cheak out your computer or contact Club Penguin. I saw some plotting puffles (puffles huddled in a circle "talking" to each other) at the beach and pet shop. Does this mean something will happen? :O!? Herbert doesn't really have a middle name. The P stands for Polar. Herbert Polar Bear. I'm not sure. It could of been showing that the puffles were more friends and the black puffle was on the side/not friendly. His middle name is Polar. So it's Herbert Polar Bear and he comes form the North Pole. Makes sense, doen't it? Thank you very much for contacting club penguin. Hope my ban, becomes unbanned. jaden58213 the same thing happened to me! I also e-maid cp to let them know what was going on. I gess we just have to hang in there untill it gets fixed! Hey Momo! When are you gonna post STAMPede party pics? So awesome! Last year I didn't get to all the rooms because it was when my penguin was just created and I thought it was the original cp! You have a good eye for detail! Thanks for letting Mimo know. I thought this was just a glitch, seems CP have removed it. The Box Dimension is cool! Try not to let your Orange Puffle eat too many cookies! Hiys mimo when i go to feed any colour puffle it turns white? is it just me? by the way you can earn a stamp if you bring your puffle to the right place!! hey, if you go in the box dimension the snowballs are cookies! and after a while there's an orange puffle flying around! Hey, Mimo, I didn't know where else to put this, but I'm a non-member, and I logged in normally and I started out in the Puffle Show, I couldn't get the jacket, but I did log into it. Try it out for youself! Cool. 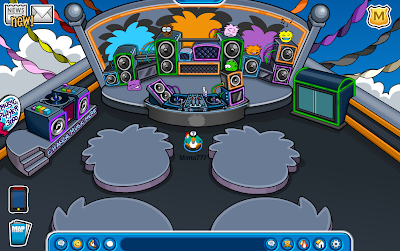 I think it is probably just a glitch ALTHOUGH some players have been typing in URL codes that enable to go to the nightclub rooftop, though I didn't know it could work for the puffle show. It's so cool, if you serve food with an apron in front of the tables in the Brown Puffle's cafe, it appears on the table!! Awesome!